Children, the psychologists will tell us, are egocentric. But whether the psychologists are right or wrong, there’s one thing The Legal Genealogist is sure of: whenever there’s a group of kids, it’s a safe bet that every kid’s maybe-not-so-secret desire is to be the favorite child, the special one. And an even safer bet that every single solitary kid’s deepest fear is being the one left out. So if there is anything in this world that I will remember longer, or more fondly, about Christmas with my grandparents, it is that none of us was ever, ever, ever, left out. And that in itself is quite a feat. So when you start to count up the number of grandchildren, well, let’s just say I usually quit when I’ve already used up all my fingers, taken off both shoes and… To put it mildly, there are a lot of us in my generation. And it wasn’t at all uncommon to have a dozen (or two) at a time crowded into the farmhouse at Christmas. But — if you’ll forgive what may be the understatement of all time — my grandparents weren’t wealthy people. In fact, it wasn’t until I started doing genealogy that I had so much as a clue that in some families money comes down the generations from parent to child. It sure didn’t work that way in my family. So how do folks who are living hand to mouth manage to make every single one of their many grandchildren feel included, remembered, wanted, loved, maybe not singled out as special but never, ever, ever, left out at Christmas? I don’t know how it’s done in other families, but in mine it was done with Lifesavers. Books of Lifesavers, to be exact. You see, we never wondered what we were going to get for Christmas from our grandparents. No non-resident grandchild ever shook a wrapped present underneath my grandparents’ tree to try to figure out what it contained. We knew darned good and well what we were getting. Each and every one of us, without exception, got those books of Lifesavers. I’d love to show you better what they looked like, but today’s Lifesaver books are different, and the only color photos I could find online lacked the contact information needed to get permission to use them. So you’ll just have to look at the 1960 ad above, and let your imagination fill in the blanks. And then the negotiations began. The weird ones like coconut, I liked better than my sister Diana, which meant there was a trade possible. She was usually was perfectly happy to take the butter rum ones off my hands, because she could then trade those to our cousin Kay for the wild cherry ones. It kept us busy for hours. Well, what seemed like hours anyway. And certainly kept us out of the grownups’ hair for a while. I’m sure that was one of the prime considerations to the parents at that point. Lifesavers to them meant time off from dealing with the kids. But oh what those Lifesavers meant to us kids! Every one of us was included. Every one of us was wanted and loved. Maybe we still harbored that secret desire to be singled out as special. But oh what a joy that none of us, not a single one, never, ever, ever, was left out. Image: Mason City (Iowa) Globe Gazette, 30 Nov 1960, p.35; Newspapers.com. As the first-born of seven and the first grandchild of 25, I can so identify with this post. I have WONDERFUL memories of childhood, including those shared with cousins, on all of the holidays. And you are right — no one was ever left out. We were all special. This was the first Christmas with our granddaughter and guess what showed up under the tree? Gummy Lifesavers…the tradition continues, just a little different. I remember those Lifesaver books too, and loved them! I didn’t come from a big family, and I don’t remember who gave them to me – possibly a stocking stuffer or from a school friend…but I loved having them all to myself and not having to share with my little sister 🙂 Thanks for the fond memories, Judy! Golly, so many memories you brought back with this blog. My cousins and I walking with Grandpa across the pasture, Grandpa takes his axe and cuts down a small cedar tree. Kids carry the tree home, uncles put a stand on it, my Mother and Aunts string popcorn with needle thread to wrap around the tree, tide soap mixed as a paste for snow on the limbs, few ornaments but no lights. Uncle takes us that night to see if maybe we can see Santa pass by in the sky, nope, we missed him but when we came back in, Santa had left our presents. Cap gun and holster! I was the fastest draw on the ranch! This really brought back memories as we also used to get Lifesaver books from our grandparents. One year I ate the entire book on Christmas morning and was sick the rest of the day! As I recall, it was the cloves flavor that put me over the edge. I still don’t like anything flavored with cloves! Even though they’re packaged differently today, I still use them as gifts each year-now for great nieces and nephews. These are important stories to capture and pass on to our own grandchildren. I have been so busy trying get “important” stuff that I forgot that the details are the context for the bigger stuff. I too grew up in a huge extended family with lots of cousins. On my dad’s side, there were two “sets”, one the older cousins, born when the older siblings were young. Then there were us younger cousins- I was the oldest of them, and the youngest of the older set was about ten years older, so of course we all didn’t get the same thing. I don’t know what the older cousins got, but us younger ones all got shoebox packages my grandparents made just for us, such as our favorite kind of jam, a hanky with crocheted edging, or a red neckerchief. Most was home-made, some came from the farm store, but each package was tailored to the grandchild who got it. Best of all, we each got a cloth bag of pennies. Long after I knew that dimes were worth more than pennies, I loved the heft of the pennies, and counting them out. We all got the same number of pennies, and oh, my, did we feel rich! I suspect that we each were convinced we were our grandparent’s “favorite”. They made us feel that way. You were indeed blessed, Judy. And yes, I remember the books and I remember thinking how impressive it was to have that many rolls of Lifesavers all at the same time. I felt wealthy! I was not blessed by having living grandparents and would have gladly traded 1000 books to have them there for me, favorite or not. Any way I could have had them would have been too good to be true. Once again, thanks for the stimulus to remember the memories……………..
Lifesaver books! I remember them and loved the process of elimination of eating every single flavor. But I don’t think we ever traded – hmmmm, what fun I missed out on! Thanks for sharing your memories, Judy. You also learned cooperation and negotiation skills too. It is funny, we grew up poor and did not know it because everyone of our peers grew up the same. I was scrolling back through some of your older blogs and ran across this one that brought me to tears. 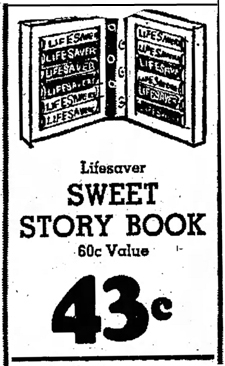 The Life Saver books were a tradition in my family also. It wasn’t my gift at Christmas, but it was one of my first childish gifts to my father and that special gift that he looked for each succeeding year up through our last Christmas together – 40+ years later.